My reading habits are actually fairly clear-cut since I almost always prefer print. It is possible that this is partly because I don’t own an e-reader, so perhaps I just don’t know what I’m missing out on, but that is the current state of the way I read. Pretty much the only reason I read on a screen is because of school and the scholarly articles we’re asked to engage with in our coursework (usually downloaded in PDF format which I hoard on my desktop as seen in figure 1). My preferred method of reading is still print, and I often find myself tracking down print versions of readings even when they are available online. The reason comes from the pretty mundane fact that reading on a screen really strains my eyes. Maybe it’s time for an eye exam, but in my experience this is a pretty standard complaint of folks regardless of whether they have perfect vision or glasses. Preferring print has less to do with disliking the format or the features of the online article. I really enjoy the ease of annotating PDF texts, I find it incredibly easy to add sticky notes, bookmarks, and highlight and search the document (provided the text is compatible), which lends itself to a proactive style of academic reading. If I suspend my disbelief and imagine a world where reading on a screen doesn’t hurt my eyes I think I would prefer to read scholarly articles in this format anyway. This is due to the necessity of engaging with them with a more in depth manner than reading other types of material and therefore the aforementioned ease of the annotation process. Thus the environment and style of reading reflects the content, as I could never imagine taking my laptop to the park to casually read a novel. 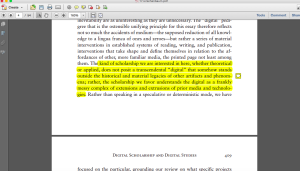 However even when I am reading scholarly articles, I still miss the tactility that goes along with reading print. I believe that the physicality of reading is a big part of how we experience and internalize the information we take in while reading. The ease of rifling through pages and getting a tangible sense of what you are dealing with, creates a sense of control and understanding of a document as an entity. I often find myself losing my place and having a tough time referring back to pages in the PDF format. That being said, it saves my desk from becoming even worse of a mess than it already is! The other type of “reading” I do on screen is via the consumption of images through social media on my iPhone. I will occasionally happen upon an article (for example, a news article – not so different from a scholarly article in terms of content and length) I actually wish to read, in which case I’ll hop on my laptop and read it there so that the text is larger and more visible (I realize I’m starting to sound seriously elderly here). I suppose in some regards it comes down to the length of the text. I can handle reading an article on my laptop because I know it won’t be extremely long, so its feels like a feasible thing to stick out. I can’t imagine trying to read an entire book off a laptop screen without my eyes drying up completely. I am aware that some e-reader screens offer a slightly different experience that is not supposed to strain your eyes in quite the same way. I could perhaps get used to reading in that format, but because I grew up reading books in the traditional sense, the process of reading and enjoying reading is not just a mental and emotional experience but deeply physical.